Habitat: The plant is native to Peru. Grows on waste places and coastal areas. Description: Sprawling, succulent, annual plant. Grows up to 1 meter. Leaves are large and round, green to glaucous green on the upper side, paler green below. Flowers are five-petaled, trumpet-shaped flowers. They vary from yellow to orange red. The fruit is 2 cm broad and segmented. Medicinal use: Nasturtium has strong antibiotic, antiseptic and antibacterial effects. It also acts as an expectorant, diuretic, and emmenagogue. Internally, it is used in treatments of urinary infections, and the infections of the respiratory tract (bronchitis, angina, flu, common cold).The most common way to consume it is as infusion of leaves. 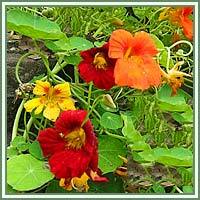 Traditionally, Nasturtium has also been used as a stimulant for hair growth. 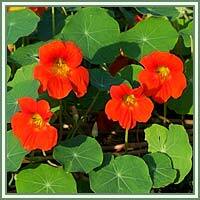 Used externally, Nasturtium acts as an excellent antiseptic in treatments of wounds and skin eruptions. Safety: Benzyl isothiocyanate, responsible for the antibiotic effects of Nasturtium, can also cause irritation if used in excessive amounts. Some herbs interact with certain medications. Consult your doctor before consumption of any herb.